Balcones Pool | Milwood Neighborhood Assoc. Balcones Pool still has Swim Classes Available here. Download Aquatics Brochure here. See below for more details. 2. You send your registration by mail to 2818 San Gabriel St. Austin, TX 78705. You will need to enclose a check payable to the City of Austin along with a registration form. 3. You can fax your registration to 512-974-9344. You will need to provide credit card information in the appropriate place on the registration form. 4. You can also register online at Austintexas.gov/parksonline. You will need to create an account. You can search for your class using the course number found in the 2016 course brochure on the bottom right menu of the search page. Do you know an individual who wants to earn some money over the summer? 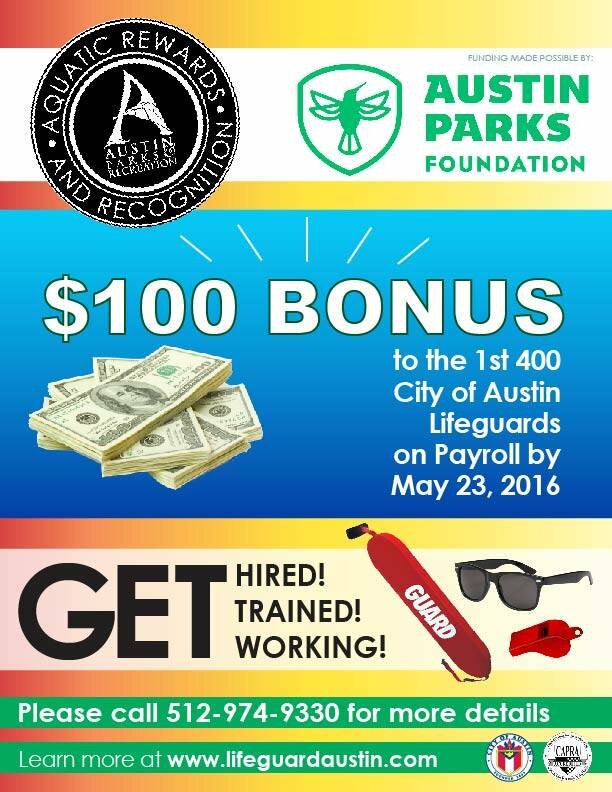 Lifeguard and act soon and get $100 bonus! 3. Once In the office we will interview the applicant and set them up with a training class. Should you have any further questions about our lifeguard position please check lifeguardaustin.com. If you should have any questions for any reason regarding the pools, swim lessons or lifeguard positions do not hesitate to contact by email at aquaticsoffice(at)austintexas.gov or by any of the information listed below. Balcones Pool’s Hours are being cut by 20% this summer. – Close the pool all day Monday, every Monday of the summer, stating that maintenance would happen on this day. – Cut the 7-8am hours on the weekdays so the pool would then open for swim teams at 8am and not for the pre-work crowd. Swim teams go from 8am to 10am. – This would create an almost 20% decrease in our pool hours. 1. Balcones Neighborhood Pool is one of only four in a large area with an active and growing population, which makes it a much needed resource for the ever growing population of North Austin. 2. The pool hosts a swim team which is critical for children learning to swim for both those on the teams and recreational users, as well as for children to get exercise. 3. The proposed cuts in hours would cause a near 20% decrease in Balcones Pool’s hours. 4. The loss of an entire day (Monday) throughout the summer is unacceptable especially due to the already limited dates throughout the year that the neighborhood pool is open and the fact that this would result in a 20% reduction in the swim team practice hours as in years past they have practiced every Mon, Tues, Wed, Thurs and Fri from 8am to 10am. – Out of 29 neighborhood pools, the Balcones Pool is the 6th Most Used neighborhood pool based on Attendance by Population in the city using 2013 Attendance and 2014 Population. In this Neighborhood, a library and pool closure on a Monday is going to hurt some families. The limit of activities for children to have a cool place near home to go shows a lack of foresight on the part of the city for our area. The Library is open on Monday, Closed on Sundays.